Shortly after my EL34 tube review on Wall of Sound, Jon Esau of www.thetubestore.com asked if I might be interested in reviewing a bunch of 6L6’s. It happens to be one of my two favorite tubes, right up there tied with the majestic 845 that I use in my Line Magnetic amplifier. An offer I couldn’t refuse! Like the EL34 and the less common 6V6 and 5881, the 6L6 is revered by rock, blues and jazz guitarists. I find that in the single-ended configuration it is usually superior to the EL34. Even in push-pull configuration I prefer the 6L6: my Primaluna Prologue One was significantly more fluid and musical with the 6L6 and it’s no coincidence, I think, that the finest Japanese push-pull amps tend to use the 6L6 instead of the EL34 (think Leben and Air Tight). There’s more lusciousness, more punch and fluidity, more romance, especially with piano. Like the majestic 845 tube the 6L6 was brought into the world during the mid-1930s by RCA although in this case, many argue, RCA borrowed some intellectual property from Phillips and tweaked it. In any case the 6L6 beam tetrode is behind the sound of tens of thousands of classic rock, blues and jazz albums. Today the tube is commonly employed in guitar amps and audiophiles have never had more options to buy affordable 6L6-base integrated amplifiers from the vast Chinese emporium. I was fortunate to spend a few months comparing and contrasting these fine tubes. 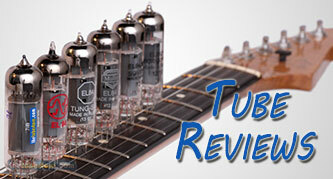 I would be happy using any of the tubes reviewed–there are no bright, glassy, hollow duds. The world will be a richer place when the last of China’s NOS stock from the 1970s and 1980s is gone–those truly are ghastly tubes. Today’s Chinese and Russian tube production emerges from a different universe. The quality is high across the board. The only things I am certain of are these: among the current production tubes reviewed the Tung-Sol would be at the very top and the Svetlana, while perfectly enjoyable, would be near the bottom. As for everything in between–it’s really a bit of a subjective toss-up, an expression of my personal taste and the performance of the tube in one single Musical Paradise amplifier. A big thanks to www.thetubestore.com for lending me these fine tubes. I listened primarily with my US-made Tekton M-Lore loudspeakers, rated at 95dB sensitivity and an easy 8 Ohm load. These are world-class speakers for under $800. For amplification I used only the Musical Paradise MP-301 mk3 Deluxe edition integrated amplifier. It’s a fantastic little single-ended amplifier designed by Garry Huang in Edmonton and made in China. The amp is serviced, if the need should arise, in Edmonton. I know of no greater value in the world of tube amplification under $500. In the preamp stage it’s vintage RCA metal, all the way! My sources were a Marantz SA-15S2 Limited Edition CD/SACD player (for both redbook CD and SACD) and the new Musical Paradise DAC-2 for redbook CD using the Marantz as a transport. I listened in a 12 foot by 24 foot living room with 9 foot ceilings, plaster walls, hardwood floors with a scatter rug, and plenty of damping courtesy of a couch, two armchairs and the irregular profile of several hundred books and papers sitting on built-in shelves at the far end of the room. The Tung-Sol 7581-A (USD $29.95 each) is surely one of the finest current production power tubes available in 2016. It’s flawless. It is always in complete command of the music. That may be because this tube has a plate dissipation rating of 35W as opposed to the typical 30W for a 6L6-GC. The Tung-Sol took my Musical Paradise MP-301 mk3 Deluxe version to a new level. It has almost zero noise through speakers and headphones alike. It’s dynamic and crunchy like a KT-120 or KT-88 but with more warmth and depth. It has nice tonal saturation but it’s not excessively mid-rangy like some old RCAs I have owned. It can dig up micro-detail but it’s never bright. It’s in control of the music even at low volume levels–this might be its finest attribute for those considering near-field listening applications, as in an office or den setting. It can do romantic and can be luminous but it can rock the house too. It can sound surprisingly deep and powerful. It throws an immense soundstage but it’s disciplined: images are stable, firmly locked in place. On Tomasz Stanko’s Lontano one can hear deep into the music and this tube captures the distant decays of Marcin Wasilewski’s piano like my far pricier Audio Research/First Watt pre-power amp combo. Cymbals shimmer and shine. The 7581-A is big, up front. It follows aggressive beats without a drip of sweat. No other tube has imparted such a sense of strength and complete control to my Musical Paradise amp. With this single tube, my MP amp is now as authoritative as my pricier EL34-based Coincident Dynamo amplifier. This Tung-Sol’s a keeper. It seems to possess virtually all of the attributes I love about the 6L6 family–the elastic-like punch of guitar, the almost unparalleled ability (outside of directly heated triodes) to capture the warmth, depth and reverberant romanticism of a fine piano–but with added power. It’s like a marriage of the KT-120 with the 5881. Perfection. The TAD 6L6 WGC-STR (USD $28.95 each) has been in my stash for five years. It’s still going strong and it stood up very well to all the other tubes on review here. This is a full, warm tube with tamed highs and rich mids. Bass is not the best but it’s not flabby either. It simply lacks that extra sense of power and articulation you’ll get with the Tung-Sol 7581-A. But woodwind instruments are perfect–clarinet lovers, here’s your tube. Vocals soar and there’s rarely sibilance. It’s no slouch with sax either: if you wish to feel Wayne Shorter’s sax flutter through your room on the Miles Davis album E.S.P., here’s the ticket. If you want to feel the complexity of Grant Green’s apparently sparse notes, here’s the tube equal to the task. There’s always a great sense of fullness in the mids. The music flows with ease. This is a great all-rounder. Warm and magically delicious! The Preferred Series 6L6GC (USD $29.95 each) is an in-house design from www.thetubestore.com. It is a newer, revised version of the TAD 6L6GC-STR (I reviewed the WGC, a slightly different tube). The Preferred Series is intended to improve on the TAD GC. It includes a black plate, double halo-style getters, gold grid wires and heavy gauge glass. This tube has no obvious major flaws. It’s big and airy, with a wonderfully large soundstage. There is a nice sense of rhythmic flow, as with the TAD and the SED Winged C under review. It’s a more balanced tube than the TAD, not excessively mid-rangy. Some listeners might rate the Preferred Series higher than the TAD for that reason; my preference is for a bit more richness and warmth. Bass is above average but not super deep or dry. With my Musical Paradise amp, this tube worked well but not as well as the Tung-Sol 7581-A or the SED Winged C. Compared with those two great, perfect tubes, there seemed to be a touch of body, some tonal colors, missing in the middle. Bill Evans’ piano on Flamenco Sketches was a bit glassy (and even glassier with the Svetlana and JJ). Saxophones were not as full and aflutter as they were with the Tung-Sol and the SED. Having said that, this tube sounded superior (to my taste) to the Svetlana, the Mullard and the JJ. It has an ease and a flow that some will find addictive. It’s a smooth tube, great for jazz guitar, not a crunchy one for rockers. At least not when used with the Musical Paradise MP-301 mk3 amplifier. The JJ 6L6GC (USD $19.95) was the biggest surprise of the lot. At just under twenty bucks there is no better value. Don’t let a snobbish aversion to the low sticker price fool you–this is a great tube, especially with acoustic jazz. Using the Musical Paradise MP-301 mk3 Deluxe in that context I absolutely loved the JJ. It had firm bass control and a great sense of air and ambience. It was never thin in the mids. It did suffer from a bit of noise at idle and that did bleed into the headphones (Beyerdynamic DT-880s and HiFiMan HE-400s). But using my 95dB sensitive Tekton M-Lore loudspeakers I heard no noise from 1.5 meters away. The tube glows a purple haze but it’s not really the best match for Jimi’s oeuvre. It was better suited to Duke Ellington’s Mood Indigo. It wants you to play piano, double bass, drums, horns, sax. Piano sustain was above average. Piano and jazz guitar tonal colours are generally ravishing. The tube seems powerful. It allows for great instrument separation and a big soundstage. But with the MP amp it does tend to make poor recordings sound poor. Sometimes rock from the 1970s did not fare well, sounding a bit shrill. This tube does have a longstanding, strong reputation with electric guitar players so keep that in mind. For those about to rock, here’s an inexpensive workhouse with a proven track record. The Mullard 6L6GC (USD $35.95) is on the pricier side for a current production Russian tube in this family. I found it needed quite a bit of break-in to sound worth the price. Once it did break-in, after maybe 50 hours or so, I was impressed. In direct contrast with the JJ, the Mullard is the perfect tube for audiophiles with loads of 70s rock or other bright or poorly recorded music. Case in point: one of Bob Dylan’s greatest albums is also one of the most poorly recorded: Blood on the Tracks. With the Mullard, the shrill and poorly mixed guitars are now listenable, especially on “Tangled up in Blue.” I found this to be a somewhat reserved, relaxed, mellow and soft tube. It’s got that vintage RCA 6L6GB tone. Many people love that sound; I’m not a big fan. Others might rate this Mullard much higher. To repeat: the difference in ‘quality’ between the tubes under review is small and subjective. The Mullard was certainly great with acoustic and jazz guitar. There’s a bit of that Sylvania punch and tonal compression. Its obvious strength is its vintage tone but with my Musical Paradise amp it was not the most powerful sounding tube nor did it excel with detail or ambience retrieval. If you want that 30th Street recording studio ambience, you’d be better off with a more neutral tube like the Svetlana. But if you want to chill with Louis and get ‘that old feeling’ this would be perfectly suited. The Svetlana 6L6GC is a $26.95 (each) is yet another inexpensive good-sounding Russian tube. In my Musical Paradise MP-301 mk3 Deluxe the Svetlana is an open, airy, neutral sounding performer. It is clear and less demonstrably warm and thick than the Mullard. It might be a tad quicker than the TAD and it sounds a bit less powerful and restrained. It’s strength is with ambience retrieval and a sense of holography. If that’s your taste, drink up! It has no major flaws. Bass is crisp and highs can soar without ear bleed. For the price it’s nice and will suffice. I saved the best for last but since it’s no longer in production I have set it aside from the rankings of the current production tubes discussed above. The SED ‘Winged C’ 6L6GC (USD $75.95 each, NOS) is an epic tube. As in… Fifty-Year Wave Bells Beach tubularly once in a lifetime. This is a steal, a radiant gem. Bodhi’s on the beach…and Utah’s out of reach. The treasure’s still within grasp. Seen the prices of vintage 300B or EL34 lately? Seventy-six greenbacks isn’t pocket change but neither is it insane. Grab ‘em while they last and don’t look back. I once owned a quad of these tubes and loved them in my Primaluna Prologue One. What a fool I was to sell them before they became NOS! My listening notes say: “A perfect tube. Rich but detailed. Quiet. Ample, slightly plummy and rich bass…not particularly dry, but more realistic as a result? Soaring highs. Bouncy and elastic mids, arresting in beauty as the tube turns and twists distorted jazz guitar notes inside and out. Piano as rich and warm as with my 85 pound 845-based amp. By far the most bouncy and elastic tube under review. A bit of that Sylvania NOS tone but less coiled up, with greater range… wider bandwidth? The quality of this tube should put to rest all the silly blanket statements we see regarding ‘poorly made’ Russian tubes.” The SED Winged C displays no sins of commission, no sins of omission. It’s the most versatile tube of the bunch. Once these tubes are gone, the Tung-Sol 7581-A may well be regarded as the greatest readily available 6L6-family tube. For jazz heads, I’d go with the SED. For rockers, I’d probably recommend the more powerful Tung-Sol. In fact, I recommend you buy both. The 6L6 has nothing from Philips, it was designed to get around the Pentode patent that Philips had using a completely different construction. It does use technology from Marconi in the UK though who licenced the beam tetrode design to RCA and others. Thank you so much for this Sandra. My current 6l6 guitar amplifier is a first version valveking 112. 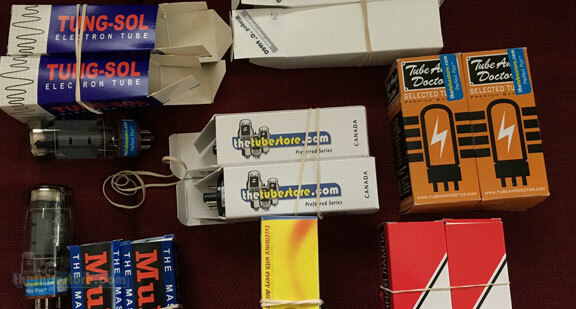 Your review of 6l6 tubes has helped me decide which tubes I want to put in my amp.